Here is a selection of products to meet the needs of some of the various ‘parts’ each of you play; Spiritual Warfare; Juicing for Health; Sweet Dreams Melodies for little people by Oodles World; A true story from one of our ‘brothers’ in the trenches; One of the BEST financial books available; and even some close-out bags that help stop human trafficking. We wish you the happiest of holiday’s this year. You really are blessings to us! Taking our captivity away from the devil represented one of the most important parts of Jesus sufferings. This affects all human beings from the most downtrodden to the most successful one. Somehow part of our soul is held prisoner rather through sin, sickness, fear, or pain. The Juice Lady, Cherie Calbom, provides all of her most popular recipes for juicing, smoothies, shakes, soups, and sauces, in one complete volume. Juice and smoothies are sweeping the nation! Why? They’re fruity, delicious, easy to make, and packed with powerful nutrition. It’s no wonder everyone is enjoying the convenience and great taste of these healthy meal and snack alternatives. Bring your blender or juicing machine into the twenty-first century with the most updated versions of Cherie’s recipes to be found anywhere—more than just refreshment, these recipes enhance your energy and boost your mental and physical health. Sweet Dreams is a brand new album of comforting bedtime Scriptures set to original lullaby melodies. Sung by award-winning vocalist Cassie Byram and accompanied by beautiful, classically inspired instrumentation, Sweet Dreams will appeal to young and old alike. It's designed to help anchor God's Word into young hearts at the earliest of ages. Sweet Dreams is the perfect gift for baby showers, baptisms, dedications and so many more treasured family occasions. And by the way, Sweet Dreams has also been known to soothe the savage beast in grown ups, too! This is the true story of one man’s continuing fight for a world free of religious persecution. Majed El Shafie was arrested, tortured, and sentenced to die after he converted from Islam to Christianity. His dramatic story, and those of others worldwide who are suffering persecution, are told in shocking, yet sensitive detail. Especially startling is the true story of rescuing a very young Pakistani girl who experienced horrific sexual abuse—because her family would not convert to Islam. Although hard to imagine and even harder to accept, this important truth about religious persecution is blatantly exposed. Millions of families are praying for help. They are suffering daily in China, Iran, Iraq, Egypt, and many other countries—solely because of their beliefs. Freedom Fighter is Reverend El Shafie’s outreach—it follows his heroic work over a four-year period as he traveled to Pakistan and Afghanistan to investigate claims of abuse, persecution, and slavery and to speak truth to governments that neglect and violate the human rights of their citizens. This fight involves all believers—please help. This question and answer book is the perfect resource guide for equipping individuals with key information about everyday money matters. 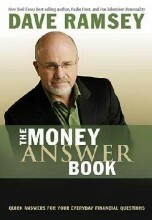 Questions and answers deal with 100+ of the most-asked questions from The Dave Ramsey Show-everything from budget planning to retirement planning or personal buying matters, to saving for college and charitable giving. This is Dave in his most popular format-ask a specific question, get a specific answer.